After a week of re-learning music theory I punched out some music for my organ. I built a few tools so I can measure everything to scale. 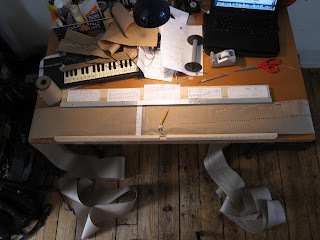 It was fun seeing music made with holes on paper. The paper had to be cut exactly 5 1/2 inches wide, and the length is based on how long the song is. For every second of music, 70mm of paper is needed.